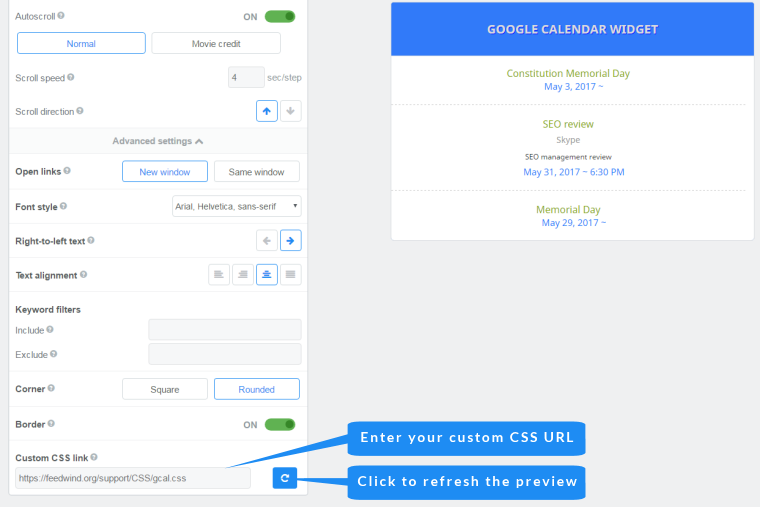 As with all our widgets, you can use CSS to create a custom Google Calendar widget and match any website design. The setup screen for our Google Calendar widget allows you to create a variety of different styles. However, we understand you may need your widget styling to match your site design more closely, so using CSS you can achieve almost any styling you want. Tip: If you use an online site building platform with no available storage for CSS files (such as Wix or Weebly), or for any other reason you want to store your CSS file elsewhere, please check out this article on how to use Dropbox to host CSS. Use your favorite text editor or software to prepare the CSS file for your custom Google Calendar widget. Notepad++ is a great free editor that is ideal for creating a CSS file, but there are others available online. All you need is a text editor that does not apply any formatting such as font sizing etc..
A basic file would look something like the example (see below), and produce the simple customization you see in the example below. As you can see the CSS is split into three sections; the Container, Header and Content. We have commented these . You can simply copy this code into your code/text editor and modify the contents, then save is as myfilename.css (or whatever name you want, but it must have the .css extension). Click on the >Advanced Settings link in the “General” section of the setup screen. Enter the URL of the custom CSS location in URL of Custom CSS box. The new design will be displayed in the Preview area. Here is an example the result of using the above CSS in a Google Calendar widget. With CSS you can create virtually any custom Google Calendar widget design you want!